I love making pendants with interesting rocks so much, sometimes I get away from making earrings. Yet, if most women are like me, they always put a pair of earrings on when they leave the house, but not necessarily a necklace. Anyway, that's me. If I don't have earrings on, it's like I left home without shoes on. So I think I need to spend a little more time making that part of jewelry ware. 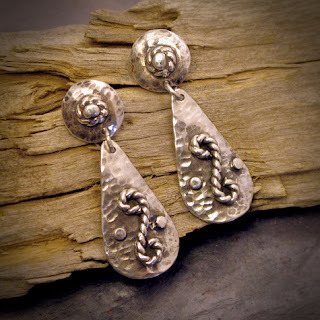 So here is a photo of a pair I made recently. I love these. These can be worn almost anywhere. A pair of jeans or getting dressed up. Sterling silver earrings with ear posts.